Sew Like My Mom is on a roll! 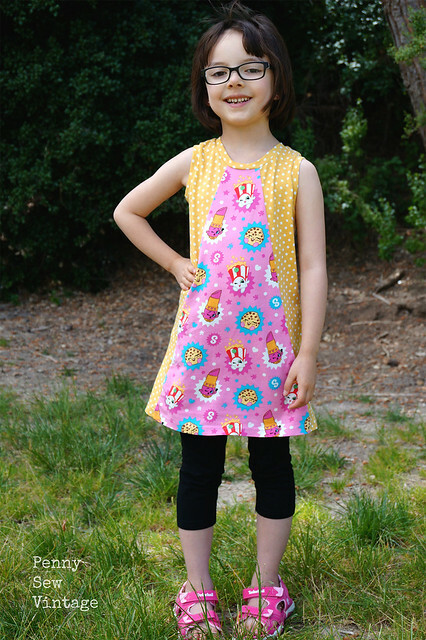 Before she even released the Plum Dolman pattern she was drafting this girls’ dress, and it’s incredibly cute. The Mandrake Dress releases today, and it’s fast and so perfect as a staple dress for my girls. This is another knit dress that is available in sizes 12 months to 16 years, and it features fun color blocked front and back sections. There are 4 sleeve options and a hidden kangaroo pocket too. I didn’t think I’d have enough time to test this pattern, but I really wanted to, and Melissa is so nice she didn’t give me a hard time even though I was totally useless during the testing process! I ended up making a sleeveless size 4 sans pocket, and although my girl is the height for a size 5, I didn’t add any length. 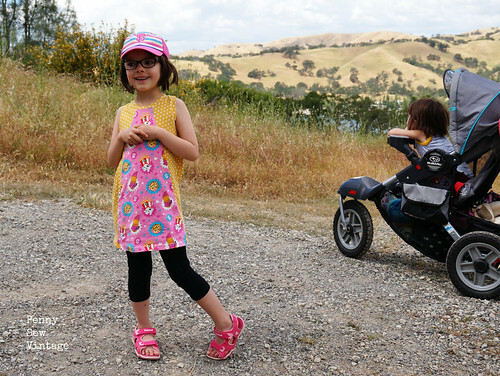 She almost always wears her dresses with shorts or capris, so the shorter length would still be functional and cute (it’s only 1.25″ short). 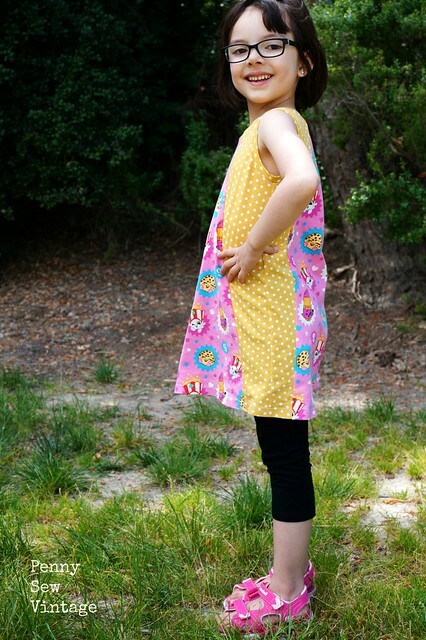 I used leftover Shopkins fabric and this great polka dot fabric which is one of Girl Charlee’s Bolt prints. 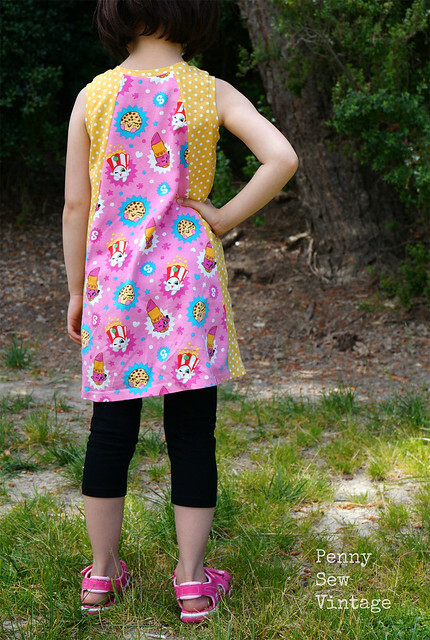 I’m really liking their Bolt fabrics and have this polka dot print in three colors. 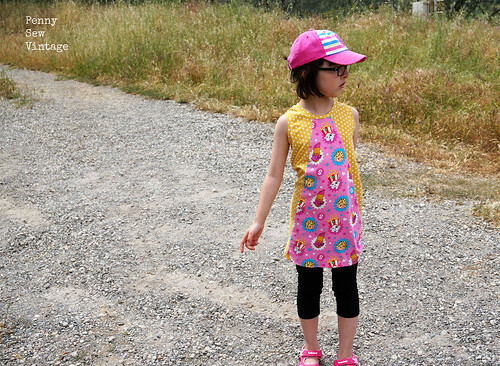 My girl wore this dress for Mother’s Day, and she reluctantly let me take pics of her after our picnic. She just wanted to run into the lake, which she did immediately afterwards! We also went for a hike, and I just kept staring at how great the dress fit her and how perfect the color blocked section was in the back. It’s cut in a way that forms around the entire back side to the hips, giving the dress a very flattering look. It’s thoughtfully drafted, not just a quick color blocking section to make it different. We had an amazing day, and the weather was so beautiful. I can’t wait to get more family hikes in now that the weather is getting warmer. My littlest one still isn’t into it yet, but she does love the views (even if it is from her stroller for now!). The Mandrake Dress is on sale through Wednesday and available in sizes 12 months to 8 years, 6 – 16 years, and as a bundle. I see more of these for sure in my future as their color blocked nature makes them easy to use up narrow pieces of leftover knits, and knits in general are just easier to care for (I despise ironing wovens!). I also see this as an easy cropped top too, so you’ll probably be seeing more of those as my knit scraps are taking over my fabric closet! Do you save your knit scraps? I’m so bad, I hate wasting anything, so I’ll save even the tiniest scraps and tell myself they can be used for pockets. Yeah, when have I ever sewn a knit pocket?